Recap of the Tale of the Epic Super Hero Battle! On Saturday, November 17th Improv AZ had its first Flashmob Fiction event – The Tale of the Epic Super Hero Battle! We’ve done Epic Super Hero Battles before, but this one had a unique twist. We gave our agents an mp3 of instructions to download and play during the event. 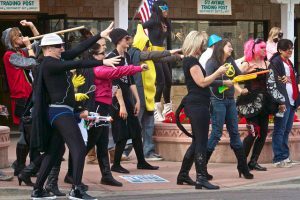 Dozens of agents donned a colorful array of wigs, masks, capes, and spandex and gathered in Old Town Scottsdale. At the appointed time, we all pressed “play” and followed the instructions as it led our group down 3rd Avenue. At our first stop, it became obvious that there was not one but two recordings – 1 for the villains and 1 for the heroes! Unlike past battles where participants got to select their team we randomly assigned agents into alliances with good and evil. The groups split up to dominate separate areas of Old Town. The heroes sang the worst rendition of the Spiderman theme song ever and tried to engage with the patrons at Dos Gringos, despite their best efforts to ignore the wily colorful group. The villains leered and sneered their way up another street intriguing the nearby children, patrons, business owners, and one uncomfortable-looking armed security guard outside a high-end jewelry store. The battle culminated with a massive face-off between the groups. The heroes initially tried to quell the villains with an onslaught of bubbles, but had to resort to stronger powers if they were going to have a chance at victory. Eventually the heroes and villains grew tired long enough to look at each other and realize that they were fighting the people who were once their friends. Instead of continuing to fight, they clasped hands and skipped off into the imaginary sunset. Of course this flash mob had its fair share of onlookers and paparazzi who grinned, laughed, took pictures, asked us what we were doing, and even began to follow us in a mini-parade to see how the story would play out. Pictures, Write-ups, and Thank Yous! Check out some of the great superhero battle pictures on Flickr! A big thanks to Sheila Dee and Patrick McLeod for being our roving (running) photographers. We’ve had some problems with the video, but are hoping to get it sorted and get a video up soon. 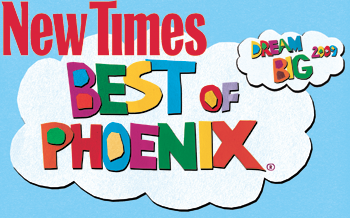 We also had some excellent coverage in the Phoenix New Times, who posted a Super Hero slideshow, and their take on the Seven Most Interesting Heroes/Villains. Did you make the list? Thank you to everyone who helped make our first Flashmob Fiction a huge success, including Evo Terra for recording the tracks, and Debbie Walker for doing all the audio editing. 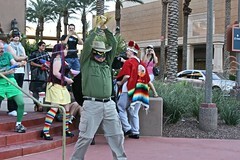 Download the mp3 for the Epic Super Hero Battle flash mob! The mp3 file for our first Flashmob Fiction story, The Tale of the Epic Super Hero Battle, is now available! You can download the mp3 from our Flashmob Fiction page, but do not listen to it until the flash mob starts. That would spoil all the fun! All the info for the flash mob is on the same page, and we hope to see you there!